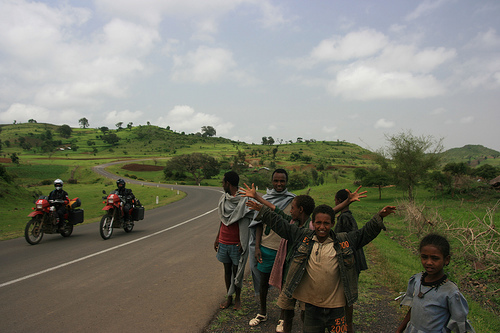 I am pleased to announce that the above picture was recently selected as the Grand Prize Winner for the Horizons Unlimited Motorcycle Travellers 2009 Calendar competition. I took the photo on Guagua Pichincha Volcano in Ecuador while Ted and I were on our 2007 motorcycle adventure through the Americas. 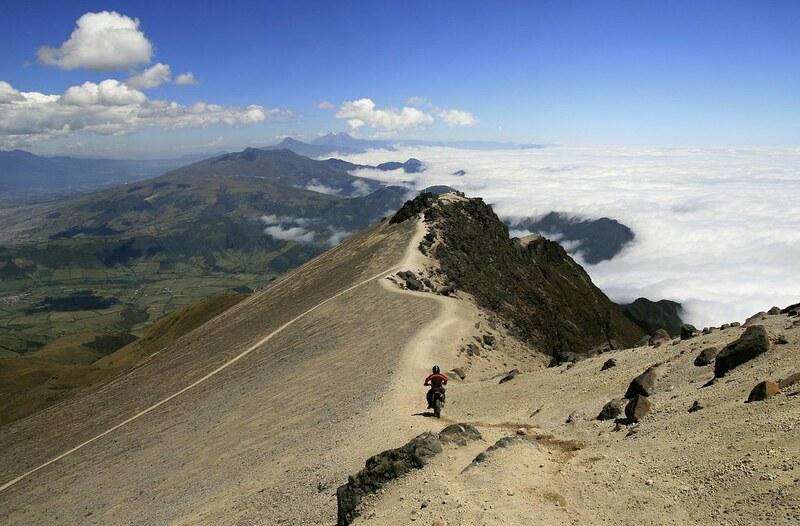 It shows Jose Rodriguez from Ecuador riding his Honda CRF 450X along a narrow ridge on the rim of the volcano at an altitude of more than 4700 metres. Ted and I weren’t able to get our bikes up the last couple of hundred metres because the slope got too steep and rocky for our heavier machines. We were also not serious Enduro racers like Jose. Even had I been on a lighter bike, I’m not sure I would have made it to the top without soiling myself. Jose kindly put us up in his home in Quito and took us on a motorcycle tour of the spectacular area surrounding the city. Ecuador is one of the most stunningly beautiful countries in the world, with towering volcanoes rising to dizzying heights above rolling green countryside. These days, my studying is often interrupted of by daydreams of motorcycle adventures, and I often find myself being transported back to Ecuador. Then I wake up and continue to read about acute tubulointerstitial nephritis. 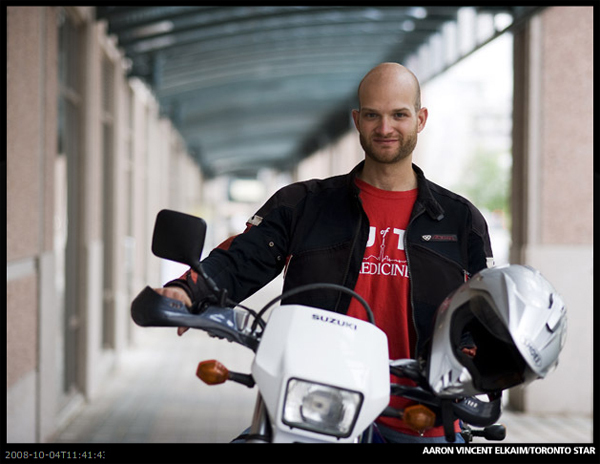 Above: Me with my new (to me) Suzuki DRZ400, which I will mostly use to get around Toronto. However, hopefully I will be abe to go on some weekend adventures in the dirt as well. The DRZ400 is the bike that I used for our training session in California’s Mojave desert before our African adventure. I loved it. Returning to life as a medical student after spending over 3 months riding across Africa is a bit of an adjustment to say the least. I went from not knowing where I was going to eat my next meal or spend the night to a highly regimented schedule. I am enjoying clerkship, but I am glad that I took the opportunity to go on my two globe-spanning motorcyle adventures when I had the chance. The luxury of having three months with no scheduled duties is something that may not come again for quite some time. Returning to Toronto was also somewhat of a reverse culture-shock. The difference in the standard of living is striking. I’m not sure if Canadians realize how lucky they are to live in a relatively safe society that has the means and desire to provide a safety net to those who would otherwise perish. The story of our motorcycle adventure from London to Cape Town has recently received some media attention here in Canada. Debra Black, a staff reporter with the Toronto Star, was interested in our story and interviewed me shortly after I got back to Toronto. A photographer also came to my building and captured the above portrait of myself and my new DRZ400 (on the day that I rode it home for the first time). The story was delayed for several weeks. I guess the collapse of the world’s financial system, the Canadian and US elections, Sarah Palin, and hurricane Ike all put a squeeze on us. My own financial crisis has dictated that I remain in North America for the time being. Perhaps the next adventure will be a short trek into Canada’s north. There is so much to explore right here in my own country. Good bye Africa, at least for now. Jerry and I in Ethiopia.